Rahul Bhardwaj gave a verbal report from the Governance Committee that had met the preceding day. He noted that under the Metrolinx Act, only a few types of business must be conducted in public, and that Metrolinx already exceeds this minimum level. Sadly, that’s not saying much, and it leaves a great deal of the Board’s activities in the dark unlike the situation at the TTC, a municipal agency for which closed sessions are limited by rules in the City of Toronto Act. The two approaches are completely different: for Metrolinx the rare exception is to debate in public while for the TTC, it is the private session that is comparatively rare. “Transparemcy” is the new watchword at Metrolinx, and to that end more documents will be published, and in a timely manner. This will include all Benefits Case Analyses before rather than after they are discussed at the Board, and reports for the public sessions in general will be available five days ahead of meetings. The real challenge will be just how “transparent” this process will be especially when it comes to financial matters where various types of privilege including “commercial confidentiality” and “government advice” can get in the way of understanding just what Metrolinx is up to. In response to public concerns about Metrolinx releasing Presto tracking data to law enforcement agencies, a revised policy was produced for the Board’s approval. The most substantive change, according to staff, is to the conditions under which Metrolinx will require a court order for the data. Specifically, events that are not related to transit incidents, involve multiple accounts or cover a longer time period would require a court order. Individuals would be notified about disclosures where possible, and Metrolinx will produce an annual statistical report starting in February 2018. Board member Janet Ecker asked whether Metrolinx has the ability to respond quickly to requests. Staff replied that there is off hours coverage, and that typically work will begin on retrieving information when a request comes in, with the actual release occurring when the formal request arrives. The individuals who make these requests are usually known to Metrolinx . Ecker asked whether anything controversial remains in the policy. Staff replied that not requiring a warrant in every case remains an issue. Chair Rob Prichard favoured a more restrictive process for privacy with legal authorization in all cases as is done by telecom providers. Staff replied that typical cases would be assaults and missing person searches. The policy was approved subject to final comments from the Information and Privacy Commissioner which, as of the Board meeting, were still pending and expected by year end. A follow-up report is likely at the February 2018 Board meeting. This report is a status update on an analysis of hydrogen fuel cell technology as a power source for electric trains in place of traditional overhead catenary and power fed through substations. The study has been underway since May 2017 by consultants CH2M. “Hydrail” is the name by which this goes today. The overall concept is to use surplus power from overnight generation to produce hydrogen which, in turn, would be used in fuel cells to power a new generation of GO locomotives or EMUs (electric multiple unit cars). The components of the system are shown in the following diagram. Part of the study involves a “concept design” for an EMU based on Hydrail power, and two manufacturers are working on proposals to be complete in the spring of 2018. This shows a “hands on” approach to the RFP with respect to technology choice, and does not entirely square with claims that Metrolinx is “agnostic” in selecting an option for RER electrification. “Innovation” is a dangerous word in transit procurements in Ontario, and it has led to politically motivated choices aimed at a hoped-for development and demands that never materialize both in passengers and in industrial benefits. Chair Rob Prichard, speaking of the Hydrail symposium held at the Design Exchance in November 2017 by Metrolinx, thought that the event was weighted to technology enthusiasts rather than critics. Staff felt that they have skeptics enough to provide balance, and noted that the lifespan of Hydrail development is longer than the issues Metrolinx faces imminently. There are areas where concepts can be challenged, and this will be incorporated in the study report. The feasibility study will be complete by the end of 2017, and will be publicly released for the February 2018 Board meeting. Board member Anne Golden asked how Metrolinx would get past the lack of Hydrail implementation on the scale Metrolinx requires. She argued that this is definitely a showstopper, and Metrolinx wants proven technology. Even so, it is worth doing research to have information on the subject. CEO Phil Verster replied that the DBFOM procurement for RER (about which more below) will be technology agnostic. He argued that there is a possibility that building a catenary-based system could leave a stranded asset. By leaving the technology choice open, he feels Metrolinx is pushing the hydrogen debate along. It is truly astounding to hear this sort of statement in a world where electric power fed through overhead catenary is a widely embraced standard. This sounds more like a parroted line from a Hydrail booster, especially considering we do not yet know the relative cost (capital and operating) and reliability of the two technologies. One technology could be “stranded”, and it might not be the overhead wiring. Because the technology choice would allegedly be up to those who are bidding on RER, Metrolinx is shifting the decision to the vendors and forcing them to bear the risk of whatever they propose. This effectively says to the market, “put up or shut up” on hydrogen rather than expecting a well-padded development contract with all of the risk on the government’s side. That’s a fine goal, but it assumes that Metrolinx would hang the vendor out to dry if their chosen system fails. It also assumes that there would be no political interference in the choice vendors were expected to propose. The business case study for RER will be updated with technology-based information appropriate for Hydrail, but this presumes that it would be Metrolinx, through its BCA process, who would be making the technology choice. If this is really being left to the would-be vendors, their considerations are different and notably do not include any of the social goals included as part of Metrolinx’ overall evaluation strategy. What are those goals, and how much is Ontario prepared to pay for them? Chair Prichard asked what proportion of Ontario’s generating capacity RER would consume. 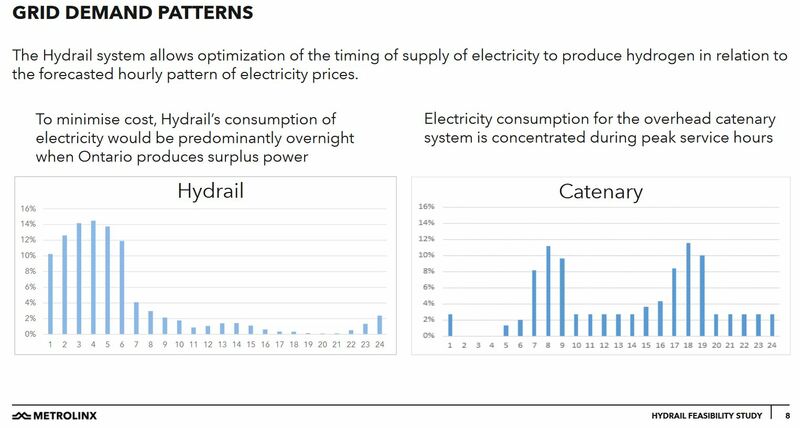 Staff replied that it would be 1% of Ontario’s daily power generation, but that there is a 2.5:1 ratio of power needed for Hydrail versus conventional electrification due to conversion losses. The total power requirement would be higher if Hydrail were implemented network-wide, not just on those segments currently earmarked for RER. The timing of the draw would be shifted to overnight, but the absolute power draw would be bigger for Hydrail. If a future power supply mix no longer included the relatively low base power produced by nuclear plants, then the assumption of low overnight power cost might not exist. Phil Verster noted that the viability of Hydrail depends on cheap overnight power, and on a 40-year timespan, the current situation could change. Board member Rahul Bhardwaj asked about the timelines of the Hydrail work versus implementation of RER. Phil Verster replied that the RFQ would come out in March 2018 with shortlisting to be complete by fall 2018, followed by an RFP process for 12-18 months. Technology decisions will be left to the market, but Metrolinx is not making a commitment either way and Verster does not see Metrolinx writing a hydrogen requirement into the RFP. Bhardwaj asked if the RFP were issued today, who could respond. Verster replied that for hydrogen this would be a small group, but a large one for catenary-based power. Verster repeated that Metrolinx has not made up its mind yet, saying that there could be huge momentum for hydrogen. This is a potential, but who knows market would offer or bid. Metrolinx is not neglecting conventional technology, he says. In effect, Metrolinx is building a completely new “GO Transit” around RER, and a good deal of this will be handled by a separate consortium. It is not a big jump to seeing the remaining fragments of GO moved to an external operator at some future date. It is worth noting here that reconfiguration of Union Station is included in the contract, and this means that Metrolinx will soon have some idea of just what changes it plans to make there. Responding to a question from the Board, Phil Verster replied that for “mature systems” (those that have been around for some time and have experience with building and operating railways), DBFOM is typically used only for “captive systems” such as the Docklands Light Railway which is self-contained. Otherwise, an alliance between the operator and bidder is more common. For new builds, DBFOM is typical. The basic problem here is that Metrolinx has never built an electric railway, much less operated one with a much higher level of service than its current GO system. As an organization, they do not appear to want to develop that expertise in house. The question down the road will be the degree to which the specifications of the original bid and service parameters foresee future changes and avoid locking Metrolinx into a configuration that cannot be adapted to more complex needs. Until we see what the Request for Proposals will include, that question cannot be answered, and the commercial secrecy of Metrolinx affairs is such that we may never know. As part of the settlement, Metrolinx has agreed to extend, by 18 months, a separate contract that Bombardier holds for operating and maintaining GO Transit service. GO Transit operations have been contracted out to Bombardier for decades, and the company’s current contract was set to expire in 2023. It is ironic that this extension does not appear in the Metrolinx press release regarding the LRVs, nor is there a separate release on the Metrolinx web site. Bombardier’s position, that the tradeoff between building more LRVs and continuing to operate GO Transit is simply a revenue offset, implies that there is more money to be made in a shorter time simply by running trains rather than by building transit vehicles. In any event, the 18-month extension puts the Bombardier contract expiry some time in 2025 with an overlap to the planned completion and commissioning of the RER trains and infrastructure. Verster noted that there is a risk for any bidder in taking on existing assets (the GO Transit rail lines to be upgraded), and Metrolinx is building an asset management database to document the scope and condition of the system today. Depending on early soundings from potential bidders, Metrolinx will structure the RFQ/RFP process with a level of handover which the market is comfortable in accepting. All of this has the air of being ever so professional except for the concern that Metrolinx could “give away the store” without our ever knowing what an alternative structure might have looked like. In the desire to shift risk to a separate entity, Metrolinx could pay more than the “risk transfer” is worth, and there will likely be escape hatches where the DBFOM bidder can ask for additional payments for unforeseen (and therefore not contracted) issues and requirements. Verster wants the focus to be on the overall RER program rather than on individual projects. His discussion of “stage gates” for approvals and of the tradeoffs between the private bidders and government policy shows that early in his stay at Metrolinx he is already embroiled in political machinations and hedging. There will be four Business Case Analyses across the RER project at each “gate”. Circumstances and designs may change assumptions from early to later stages as information “matures” such as station requirements and service patterns. The BCAs will be one factor of a process where decisions are made at the political level. Here, Verster treads on thin ice, by observing that hydrogen could have a poor Business Case for transit, but be good overall for Ontario. This implies a level of BCA measurement outside of transit, per se, although some of that is already in the BCA model through the social and economic benefits a project might bring. Some of these are “soft” benefits such as the imputed value of travel time savings or spinoff industry, while others are “hard” such as specifics of operating costs. The problem with Verster’s stance is that it contradicts the idea that the market will decide which technology they wish to embrace and how much risk to future profits they will undertake, not to mention at what cost. Bidders might be directed to follow a specific tactic for political reasons that have little to do with the improvement of transit. Moreover, major decisions such as the power supply technology must be taken early in the process as they affect everything from design onward. This is not a small scale change order, but a fundamental aspect of the contract and how it would be priced. Specifically, would the government direct that Metrolinx follow a hydrogen-based scheme even before it was known whether this would be technically feasible at a reasonable cost? Would Metrolinx roll over because this is a “political” decision? What is the value of stage gate reviews and BCAs if a political decision can override supposedly independent technical advice? We have seen this already with the station selection process, and of course for the SmartTrack and LRT/subway debates in Toronto. Metrolinx has selected five (5) Prequalified Operators in response to the Request for Qualifications (RFQ) for RER Operations issued in July 2017. The Prequalified Operators are eligible to participate as operators on applicant teams for the upcoming Design Build Finance Operate Maintain (DBFOM) procurement process for the RER on-corridor works. A market sounding exercise with interested parties for the DBFOM procurement will commence in early 2018 and a Request for Qualifications (RFQ) for the DBFOM procurement is expected to be released in Spring 2018.
Notable by their absence (unless they are a subcontractor to one of the principals) is Bombardier. It will be interesting to watch this process evolve, and to see which well-connected companies and advisors emerge as promoters. Three months ago, I wrote an overview of the new Regional Transportation Plan, and intended to follow this up with a an article on some of the background papers. That piece sits half-written in part because I looked in vain to find enough details worth reviewing. Indeed, the working title of the article is “Where Is The Plan?”. What is so striking about the published work to date is the absence of specifics. There are nice maps and a few snapshots of overall future travel demand, but no sense of how the network would work, how it should evolve and how various options might add to or hinder its success. The demand figures are unimpressive with the average modal share for transit hardly moving over decades – it actually increases within the City of Toronto while declining in the 905. This is hardly a success story. A significant omission is the role of “last mile” local services, and without them it is no wonder that transit cannot gain a foothold in areas now dominated by auto travel. There is an odd echo of this in a separate fare integration business case. This report observes that the primary reason integrated fares reduce auto effects such as emissions is that they encourage the park-and-ride trips now common in the 905 to shift to transit, assuming that there is something for people to ride. I will review that paper in a separate article. Originally, the Metrolinx Board had hoped to sign off on the Draft RTP at its December meeting, but there simply is not enough meat on the bones for them to do so. Specifically, any “advice” they might give the government about relative priorities and funding issues have not yet been addressed. Chief Planning Officer Leslie Woo noted that there are many questions about decision making and funding issues, and that this portion of the RTP would be cleaved off as a separate document. Metrolinx feels that they have “got it right” for the 2041 network, but how to get there is the issue. There will be a much broader discussion after February, but we can only hope that the background necessary to evaluate options will also be published so that the debate is on a strong footing beyond local political demands for “my” subway or GO station. In particular, the behaviour of alternative interim network scenarios is vital to understanding the priorities network components should have. The presentation concentrated on the consultation process. Appendix 1 of the report consolidates the “messages heard” by Metrolinx from the public and from various municipalities. These are presented in summary form and focus on widespread support for the plan without delving into the caveats that might have been raised. Staff reported impatience and frustration with the lack of progress, and strong support for seamlessness at the 416/905 border. There was no regional consensus about what a transit node would look like – parking facilities or collections of other services at stations. “Who does what” – the province, Metrolinx, the municipalities – is a question needing substantial public debate. Appendix 2 provides an outline of the “Making It Happen” paper. It will address several questions that, frankly, have been quietly ignored for far too long. What are the options for how Metrolinx and its partners can collaborate to implement the RTP? Which processes will enable the necessary partnerships? What are the options for phasing the actions in the plan? What are the criteria for prioritization? How should actions and projects be bundled to enable subsequent discussions on implementation? Who should lead the various actions? Who should be at the table? Who needs to participate? What are the principles and options for funding implementation of the plan? Woo noted that the change here is to focus on the outcome “what good looks like” (a Phil Verster phrase we will hear often at Metrolinx), but to provide multiple paths to get there. This will include discussion of priorities, phasing, benefits cases, management and funding, fare and service integration and effects of the Growth Plan. The section on prioritization is particularly important as it implies a more robust and less political approach to development of an implementation plan. over the horizon period. In particular, prioritizing what should proceed in the first ten years will be a key consideration. Clustering of strategies and actions will be essential to convene specific partners with the right stake and expertise to advance them, at the right time. Many stakeholders have called for “Quick wins” program similar to the original “Big Move”. Consideration could be given to identifying quick win projects and sources of funding. A robust methodology for prioritizing projects and developing options is required. Metrolinx developed a project prioritization framework that was used to recommend funding options for priority projects in The Big Move. This will need to be reviewed and updated. An important consideration will be the identification of interdependencies among projects, policies and programs/project bundling. The transportation system is interconnected system of parts that work together deliver services to users. E.g. RER will not be successful at attracting ridership growth without robust station access initiatives. Phasing considerations will need to acknowledge inter-dependencies. What are the decision points? What evidence is needed at each point? What are the methodologies that must be used to present the evidence? There is always a political desire for “quick wins” so that the government and management of the day have something to show for their efforts beyond a library of studies. However, there is a danger that the “quick wins” will be selected because they are cheap and easy to implement with little risk, but they might contribute little to solving the overall network challenges. In a worst case scenario, the quick wins are the only part of a plan that is implemented. The plan must be proof against shifting political favours, against the temptation to plan for electoral advantage rather than for the overall needs of the region. In light of current practice, the idea that “evidence” would form part of the decision-making is almost delightfully naïve. Director Anne Golden noted that Ryerson City Building Institute (which she heads) was about to finalize a blog piece about real estate as a contribution to transit development. She argued that this was an opportunity to strengthen the RTP’s credibility, but that making the plan work requires buy-in across many areas. Director Janet Ecker observed that there are stakeholders who are very important, and some stakeholders who think they are very important. How can Metrolinx avoid making some think they have been ignored? Leslie Woo replied that there will be a feedback report on what was asked, what Metrolinx can or cannot do and why. Whether that will satisfy the more self-centred of the stakeholders remains to be seen. Phil Verster spoke of the need to support co-ordination across multiple agencies and municipalities, but felt that jumping to a debate about governance structure is not a solution to Metrolinx’ problems. Leslie Woo will be setting up an intergovernmental forum to get behind the RTP at the staff level, to listen, work together and conclude debates on things like fare integration, and then inform the politicians. This begs the question of who makes the decision, and whether the choices are pre-empted by filtering of options. Aud: The in-room audience who might be called “groundlings” but for the presence of chairs. This is not an exhaustive transcript of the proceedings for which I refer you to the video record. An important change was obvious simply by walking into the Boardroom at Metrolinx headquarters in Union Station. Normally the Board sits at a long table while the public sit on chairs with, in some cases, an obstructed view of activities thanks to a structural column. For the Town Hall, the chairs faced away from the Board table, and Metrolinx officials sat on the same furniture as the audience with no intervening barrier. CEO Phil Verster began with the new mantra – Transparency – saying that he wants to learn what is important to “you”, that is to the public. He also raised the issue of “courtesy” saying that Metrolinx will share what they know, but everyone should have a chance to participate. This came up later in the meeting when a questioner challenged the staff version of an issue, and it will be interesting to see how Verster makes out with a crowd that does not start out in a friendly mood. The questions were taken on a round-robin basis from the Top Ten online list, from the audience, and from online viewers. For clarity, they are presented here grouped by related subjects, not in the order in which they were asked. The following questions as a group deal with overnight noise from construction of a new north track in the Union Station corridor west of Parliament Street in the vicinity of Longboat Lane where the site is immediately adjacent to the back of houses. Metrolinx proposes to widen the corridor. This will affect the existing greenery that screens the corridor from the houses and move trains closer to them. Even though the first of these questions was known in advance, there was a sense that Metrolinx was winging their response and did not really understand the severity of the complaint. This is not the first time GO construction has been a bad neighbour, as those along the Weston corridor know. Top10: Construction and general operations continue overnight and are quite loud. When will Metrolinx provide a noise wall and/or some form of soundproofing. GP: We understand concerns but there is a question of balance in respecting a community. Sometimes we get focused on getting work done. Better notice to residents is needed, and we can adjust where we can. As for noise abatement, there is a community meeting in January. Improved communication with the neighbourhood is needed. PV: In various communuities there are questions about noise walls at multiple locations and times of the day. Environmental Assessments and other delays get in the way of building walls. Metrolinx is putting together a booklet on noise walls – when and where are they appropriate, at what scale and cost. He is not saying that a wall is not required, but there are financial and permissions issues too. This is expected to come out in the next few months. Web: Why does RER have the new E0 track at Union 50m away from houses when 150m standard is the standard? PZ: We try to achieve 150m, but in some cases we are forced to go closer. Aud: The Longboat Association and the Caroline Coop have taken measurements of construction noise. MTO sets the maximum level of transport noise at 50-55 db. The community gets readings 20 db or more above this level since the onslaught of construction. On one occasion in October, the reading was 100 db and there were high levels of vibration. What is Metrolinx ready to do? Construction is going on through weeknights and they are not getting sleep. At this point, Phil Verster admitted that he did not know where the site in question was. Greg Percy talked about broad principles – he understands there is noise, but was evasive about what would be done falling back on the need for continuous upgrades. Notification to residents is not a fix for the problem. PZ: There is a need to discuss more about what Metrolinx can do such as installing noise walls. These answers dodged the issue of political decisions preceding and pre-empting analysis. Web: What Benefits Case updates are being done? LW: A new formal Benefits Case management process was presented at the last board meeting. There is a stage gate process to projects, and BCs are performed at the associated level of detail. The final BC for the RER project is coming in January, and there will also be the second stage BC for new stations. PV reiterates that elected officials make decisions in a democracy. Top10: What is Metrolinx doing to limit government interference? PV: The question doesn’t make sense. When you think about investment in infrastructure, government makes decisions. Government has revenue, while Metrolinx does not have its own. We give advice and implement programs governments approve. Aud: There is a grade separation on the Lakeshore East at Scarborough Golf Club Road that requires moving the entrance to a golf club. The board of that club has decided to route new driveway thru a curling club, one of two in Scarborough. Is this a sweetheart deal between a private country club and Metrolinx in compensation for moving the driveway driveway, tearing down the curling club and building a new maintenance facility. How much money are they getting? JP: The communications group is working with the golf club and there is a community working group. PV: It is important that we give clarity. If we have to buy property, we have to procure it at market price. What the club does on their property is not Metrolinx business. We will get info about this, and it could be a case of unintended consequences. Aud: In Scarborough, communities are concerned about new grade crossing on the Stouffville Corridor between Sheppard and Finch which create a safety for children whose school is across the tracks. Will Metrolinx work with city and community on this? PV: We have a lot of attention on level crossings. Traffic counts and other priorities drive the investment profile [for grade separations] and some crossings are getting attention. There are five crossings between Finch and Sheppard. Verster and staff are going to visit them. Top10: Why is the Burlington GO Station renovation entering its 6th year? PZ: Now it’s done. When we started we didn’t get it right. Utilities were found that were not expected, and this affected power supply to the new station. There were also contractor performance issues. Metrolinx now has a vendor management program, and selects contractors based on past performance. Web: Can we get update on Bowmanville? PZ: The EA is in progress, and Metrolinx does not have a construction start date. LW: Stations are included in and co-ordinated with the RER project. Top10: Why is there no plan for a Park Lawn Station in place of Mimico? LW: Last June there was a station review, and there will be further work on this at the Board’s request. Metrolinx is working with the City on a plan, and this will be one of several BCs staff will bring forward in 2018. Web: How will you improve safety and flow at Union with more service? PZ: We are at Union through 2040 and we are working to improve platforms. Metrolinx is constantly working with the City to keep operations safe. The plan is to reduce the number of tracks but widen platforms to improve the safety of access to trains. There will be elevators, stairs and maybe even escalators. There are long term implications for train access. PV: We also want to get level boarding in place and eliminate the need to align with mobility platforms. More capacity is coming in the future. LW: When the Bay concourse opens, plus the moat, plus the end of constant shifting of routes through the station, the real capacity of Union will go up. Aud: What are plans for GO bus service on Hwy 407? GP: We have about 2500 bus trips/day. They are constantly reviewed – operators have discretion to use 407 if it works. There’s always a way to optimize the service. LW: We are reviewing the RTP, and for its frequent transit network the 407 is ideal corridor in the medium term. Top10: Will there be more express trains? PV: RER will bring more service. There are things happening now (e.g. Barrie all day service). The RTP does a lot, but in the longer term and it is not all funded. The program delivery has started, and the next five years will be very interesting. Web: Can you speed up Kitchener service? It is better on VIA. GP: Metrolinx bought the KW corridor and fully takes it over in October of 2018. There are 30 grade crossings between Georgetown and Kitchener that must be reviewed. Metrolinx plans to double track and signal the line after they own it, but this needs to be synced with other work. GP agrees that Metrolinx needs to do this work, but feels it is about five years before completion. Web: What is Metrolinx doing to improve signal issues and delays? GP: Two separate things happened today. There was an investigation near the core, and a switch failure at Whitby requiring a temporary fix. Cancelled trains cause crowding. PZ: We are rebuilding to improve both for better technology and also more frequent service. Top10: Why electrify? Why not stay with what works? PZ: Convert existing lines will bring more service. PV: This may pertain to hydrogen too. Ontario is very very ambitious, with very exciting plans. This is an opportunity to think about alternatives. What we want to explain is we don’t necessarily thing hydrogen is the answer, but leave this up to bidders. If we do get a hydrogen-based system, it will be a world first. We are not specifying the technology, but will let the supply chain which has to deliver on time, on budget. We need infrastructure for 4 times as many trips per week. What shape it takes depends on the risks and cost effects, price and project schedule. Web: When will we see new tier 4 locomotives in service? GP: UPX is already running with T4 engines. New GO locomotives will begin to arrive at the end of December continuing into the new year (1 in December, 1 in January, the rest later). Top10: Can we get a breakdown of where our fares go? RS: Fares go to operating expenses. Capital projects are paid for by the government. Aud: A question from Burlington : The original Big Move had money for local transit, but this has quietly disappeared. We need the ability to get around. In Burlington a 30 minute GO service meets an hourly local transit route. Metrolinx builds parking, not local transit. LW: Money for local transit was in the Investment Strategy, but this was only advice to government. We feel that first mile, last mile is an unconquered part of plan, and we are committed to move this forward. Aud: With the danger of cost overruns on projects, how will this be controlled and the risk shifted to the private sector? PV: You can discuss the merits of various ways to fund a project. It is not just about debt levels, but also the economic benefits separate from just transit itself. We have an insatiable demand, and there is probably little debate about the need to invest. What we’re doing now on RER is to “ring fence” all of the risks. This is a model that works. On Eglinton, the rolling stock procurement was separate and created integration problems with the main project. Somehow there is an implication that without the Bombardier issue, the problems would not have happened. On Eglinton we are fixing past problems. Are are we doing 3Ps well enough? The Auditor General has flagged past problems and we are putting in processes to make things work better based on lessons learned. Aud: There is a two fare wall where GO has “negotiated” a fare reduction with TTC. Now there are trips made up of a YRT + GO + Subway journey that can get riders to UofT faster than going entirely by subway. Will Metrolinx share with the 905 how they managed to “negotiate” a GO+TTC fare fare reduction? In a recent TTC report about the UPass (a university student pass), there was talk of a cross border pass. Will Metrolinx direct staff to share how they accomplished this? Also will they look at the revenue opportunity of charging for parking and using this to subsidize fares? PV: We should remove the myth we did something with TTC. All transit operators share and talk openly, and Metrolinx has arrangements with TTC and other systems. Even though there are barriers, we need to get solutions to harmonize the systems. There will be a forum with transit operators about fares. As for parking, it is a very important part of the psychology of how people travel today. We are constantly looking at how to adjust this such as through ride sharing. LW: We act in “facilitative way”, e.g. for YRT and TTC. The Metrolinx board directed us on removal of barriers and consolidation of policies. The value proposition regarding the “1st mile” of travel is at issue regarding parking. [I cannot help mentioning that Phil Verster missed a good chance to explain how co-fares come about, as well as some of the history of the YRT-TTC relationship. When the government wants to remove an annoyance for riders, they spend money, most recently in the case of the GO-TTC co-fare. Between YRT and TTC, the situation is that York Region accepted that the subway would charge a TTC fare even for travel in York in exchange for which the Region would have minimal responsibility for operating costs and maintenance (mainly their own bus terminals). Subway operations would be funded by the City of Toronto. Top10: When will Presto uploads be in real time? RH: The need to upload and download information to Presto devices on vehicles causes the delay today. If you load at a physical machine, the update is in real time, as are autoloads [I don’t think that this is correct]. The challenge is with web-based loads, and the delay is now down to 4 hours for stations. Buses sync with the central system at their garage, but this will be fixed within two years and the update time will be reduced to two hours. Aud: Applause to Metrolinx for providing the LRT lines, but why has the Hurontario line left the Kingsbridge community with no station. The questioner also raised the problem of disabled demand in this area and claimed that the spirit of AODA was not being respected. [The area in question lies south of Eglinton which is the last stop before Square One which is on the south side of Highway 403.] What will Metrolinx do about this? PV: Metrolinx is not about giving up on a community. Leslie Woo’s team will review the situation. Aud: In the purchase of services by the TTC from Metrolinx, are prices marked up, for construction of the Lawrence East Station. Why does TTC appear to want to price the use of limited use media higher. Should pricing decisions be left to the TTC? Should Metrolinx charge TTC for the use of its tracks. PV: Projects from Metrolinx are not priced up to TTC. RH: LUMs are coming next year. As for pricing, the TTC will set that. This entry was posted in Beyond 416, Commuter Rail, Electrification, GO Transit, Kitchener-Waterloo, Transit, Union Station, York Region. Bookmark the permalink. Hanging out the vendor to dry (a wonderful expression, as if they were wet laundry) in case an integrated DBFOM contract goes astray. Unfortunately riders are left out to dry as well, as we have seen on Toronto’s streetcar routes, with Bombarier’s inability to deliver new streetcars on anything resembling whatever the latest week-ago schedule might say. Autoload isn’t literally instantaneous, judging from the charge not showing up on my Visa until hours later. But it’s seamless and invisible from a user perspective. The money shows up on the Presto card the instant it is needed. And then the back office sorts it all out after the reader syncs. I don’t know how you make self-loads instantaneous without sacrificing the quick processing time. But I suppose you could increase the sync frequency. 4 hours? 2 hours? 1 hour? How many pending transactions can a reader on a bus hold? Does every reader in Hamilton and Ottawa really need to quickly know about a pending load of someone who rarely travels north of St. Clair? It appears Metrolinx is accelerating the expansion of the swamp they’ve created through their whole modus operandi: process before product. This may help maintain all those vice-presidential and managerial positions and pay cheques, but it isn’t delivering what the public wants and needs. I guess we’re supposed to believe we’ll get the answer when Metrolinx does the study and consultation to go on top of the study and consultation that produced the RTP. Is there any more detailed information on what Metrolinx wants to do with the Union Station platform reconfiguration? Which decisions have been made and which are still being studied? For example, do the stairwells in the recently reconstructed concourses take into account the potential for reconfiguring tracks, or would the track reconfiguration require re-doing the York concourse (and Bay concourse?) renovations in order to shift all of the stairwells? Steve: The details have not been released yet, but from general descriptions there is an evident plan. Some existing tracks would be decked over to create more platform space. This would not be done all the way across the station but for some key sets of tracks. Existing vertical access would probably remain, although more could be inserted in the space now occupied by the tracks that are removed. These tracks would be used by through services that did not waste a lot of platform time on reversing at Union and going back the way they came. That could require hookups of some services east and west of Union that now run independently of each other. A related operational change would be to avoid having trains cross through the slip switches east and west of Union by aligning the track usage with the geometry of the approach corridors. In effect each corridor (or pair of corridors) would have its own clear route through Union. I have not seen any studies of passenger flows, but these would be essential to evaluating any new configuration. Meanwhile, once the new Bay concourse opens, there will be considerable added capacity and simplified pedestrian flow through the station especially to the subway. This will buy some time pending the next round of changes. 2) a stupid idea being killed in a “Yes Minister” fashion by a smart but politically constrained bureaucrat fenced in by a politician with a preferred tech provider. Steve: I am having a problem imagining Sir Humphrey’s voice (Nigel Hawthorne) coming out with Phil Verster’s South African accent. For those who are unfamiliar with Sir Humphrey, here is a sample of his bureaucratic thinking. 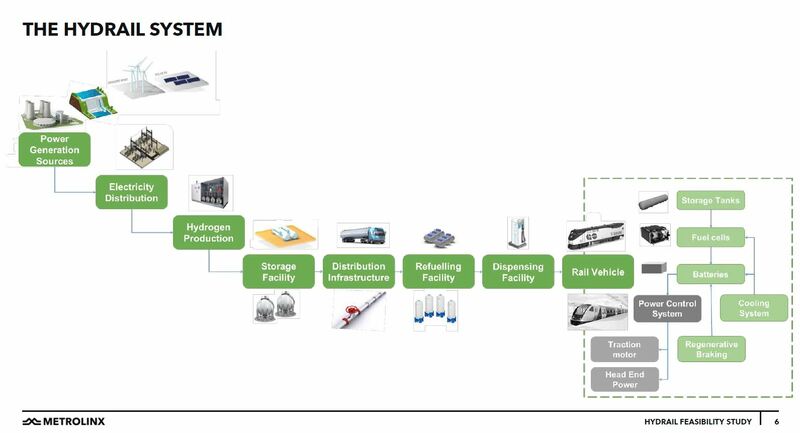 The way Metrolinx is talking up hydrogen now concerns me along with how they’re talking down a proper electrification. I have no idea where, why, or how this came up but between the two, it has all the hallmarks of the fix being in. I think we’ve all fleshed out the arguments against hydrogen and for a traditional electrification in the comments on other articles so I’m not going to rehash or belabour the technical arguments. The Toronto rush hour is brutal already. There’s been a dire need for electrification and substantial service increases for a long time now. This is not the time or place to do an expensive, speculative science project – especially when Ontario’s abysmal record on industrial policy is taken into consideration. It boggles the mind that this hydrogen nonsense is now under serious consideration and is distracting from getting on with building what has been painfully needed for many years. In terms of matching overnight electricity generation to daytime railway usage, hydrogen trains are simply not needed at all. Large scale grid-attached storage such as any of the Tesla-style battery banks that have been deployed in a number of jurisdictions or more traditional approaches like pumped storage hydroelectric generation would also serve this time shifting function with the benefit that the electrical capacity can be deployed to any load at any time, not just for trains, and the operation of traditional electric trains is not dependent on the time shifting/fuel delivery system, and neither of those advantages depend on expensive, unproven, inefficient, speculative technology that isn’t ready yet. There is no business case for hydrogen trains at all given this. I was talking with a friend of mine who’s a manager at a large transit authority in the U.S. and we were discussing if Metrolinx is good for anything. They took over an existing operation (Go Transit), built a proposal that was designed then subsequently abandoned by the private sector (UPX), built a phenomenally expensive, mediocre fare card system (Presto), and have a light rail line under construction that was conceived by the city of Toronto (Eglinton Crosstown) and has two other LRT lines that may or may not be stillborn (Hamilton, Mississauga). Other than Presto, everything Metrolinx does came from elsewhere. This is not a good track record. Also, the two LRT lines in the province that are pretty much finished being built, have cars arriving, and are undergoing testing in preparation for opening soon are non-Metrolinx projects, so it looks like if you want actual, tangible, working results, proven off the shelf technology plus no Metrolinx involvement seem to be prerequisites (avoiding Bombardier would probably help too). This does not bode well for a technology project that’s already ill-conceived from the outset like hydrogen. Ontario’s industrial policy has been a disaster. For example, work sometimes sends me to Windsor. I drive down the 401 through fields of windmills that cost a fortune when they’re spinning, generating electricity and cost a fortune when they’re standing still producing no output and the slack has to be picked up and paid for elsewhere. I pass by Tillsonburg where 340 employees just got laid off from the windmill blade factory that Siemens just closed. Siemens built the minimal plant required to make one size of turbine blades that were used on machines that were being bought in Ontario and the plant couldn’t handle larger blades, so when the worldwide market for windmills shifted to larger machines, the plant couldn’t make the blades required so they closed it. The jobs lasted only as long as the Ontario green energy splurge did. When I get into Windsor, the place I work in and the hotel I stay in are both located on Riverside Drive. I can see and hear the two car ICTS trains grinding around in circles across the river on the Detroit Peoplemover as soon as I step out the front door of either. I know that when Detroit decided they needed more rail transit, they laid streetcar track down Woodward Ave. They did not buy any more world leading Government of Ontario transit crapola and expand the peoplemover. The last thing we need is another incompetent Ontario government screw up like ICTS but this time involving the same substance that gave the world the Hindenburg the last time hydrogen was used in a public transportation application. Referring to 140-year-old technology as “proven” is just as boosterist as us hydrail protagonists. Not spelling out that catenary costs US$10 million per mile of track plus US$150,000 per mile per year perpetually for maintenance is less than even-handed. These are the economic reasons that Germany and Japan have embraced hydrail. As to stranded investment, the relative risks of a 140-year-old technology with a 25+ year life aging-out before a new one are pretty straightforward. Steve: Your argument proves just how threadbare the Hydrail argument is. Lots of technologies are over a century old, but that does not prove new ones are valid. Germany and Japan have not “embraced Hydrail” for the scope of operation GO Transit plans to operate, and the technology to do so does not exist. But, hey, if you’ve got good lobbyists and maybe a “success fee” here and there, you can say anything you like. It is certain that Japan does not have anything like hydrogen rail as envisioned by Metrolinx. Their Chuo Shinkasen is contructed with electric induction. Other lines are either electrified or running with DMUs. Only freight and certain sleeper trains are locomotive pulled. I have already discussed why hydrogen train is a bust in other posts. I am not going to repeat it here. Yes, cantenary power is limited to about Mach 0.25. However, Metrolinx will not be running anything that fast for a while. Even the HSR service to Windsor will probably not run at Mach 0.25. I remind readers that hydrogen is a net negative in terms of EROI. EROI dictates whether we live in affluence or poverty. It only takes 29 watt hours per seat mile on the Nozomi Shinkansen using the cantenary. Using hydrogen with conversion loss and other losses, it would take almost 100 watt hour per seat mile. I am all for technology. But unless the EROI is over 15, forget about it. God does not give us the conversion plant, hydrogen transport for free. Someone has to use energy to build those structure. It is like the wind mills in Tillsonburg. Which would you rather have? Using diesel generators to keep those wind mills running or use the diesel to run Caterpillar trucks in a mine. While both will increase the GDP numbers, one is economic positive while the other one is a net negative. I did some digging and hydrogen fuel cells trace back to 1839. Various types of storage batteries trace back to the mid 19th century as well, as does transmission of electricity by wire. After 140+ years of development of all three technologies, experience in moving large quantities of electricity from where it is generated to where it is used has shown pretty conclusively that running wires and connecting up your load is usually the best approach for large loads (and not so large loads – see next paragraph), infrastructure capital and maintenance costs included. Calling it proven at this point is more of a statement of fact than boosterism of any kind. So, this leaves me with a question about the Stan Thompson residence: Does the hydrogen truck come by every 4-6 weeks to fill a tank in your basement that supplies a stationary hydrogen fuel cell to make electricity for your home or is there a cable containing three wires connecting your house to the utility company’s capital and maintenance intensive, depreciating, stranded asset of wired electricity distribution infrastructure? Just to chime in as well: Germany has an extensive network of catenary electrified lines, which is currently being expanded. A major high-speed line between Berlin and Munich just opened three weeks ago – electrified. High-speed line and brand-new main station being built around Stuttgart – electrified. Germany is “exploring” hydrail on local rail transport in less populated areas. In Ontario terms, these would be connections like St. Thomas to London, Goderich to Stratford, or _maybe_ Niagara Falls to Hamilton. Even apart from the fact that the hydrails in Germany are not yet running, these are not what you want RER to be. If you want to make an hourly train from Goderich to Stratford happen with hydrogen trains, I will applaud. But it’s not mainline or commuter technology. Steve said: Notable by their absence (unless they are a subcontractor to one of the principals) is Bombardier. Bombardier was not a sub to one of the 5 prequalified, but can still qualify in the RFQ period. Oh dear gods, no hydrogen nonsense. Please. This sounds like an attempt to sabotage electrification. I hope that Verster is indeed killing this idea in a “Yes Minister” fashion… but if so it does raise the question of which deranged politician is pushing the hydrogen fantasy. Whoever it is is too chicken to put his name to it. The optimistic point here is that the five prequalified potential bidders are all sensible train operators with experience with overhead catenary, and hopefully none of them would be stupid enough to propose this idiotic hydrogen nonsense. Steve: Del Duca is the most visible, although Wynne herself has talked up Hydrogen technology. This actually started when Dalton McGuinty was premier and the technology was in its infancy, and it got a helping hand from Glen Murray while he was still in the government. It’s the classic Ontario boondoggle with a new technology where we will “lead the world”. It seems electric trains there operate at a far higher speed than GO / VIA at Union as they drive through station approaches and actually arrive into the station platforms. On a recent trip in Germany my estimate was trains were traveling at 80kph or higher until <30 seconds before arriving at stations, and often arrived at the head of a platform at 50kph or higher (i.e. very high levels of deceleration – which happened smoothly and without problems for standing passengers on the train). My sense is compared to similar sized stations in Europe this is adding 3-5 mins to journey times (or more). Yes some of this is due to (significantly) reduced breaking distances of electric multiple units… but not all. Any plans for Metrolinx to work with TTR to remove speed restrictions and hence reduce journey times for *all* trains on approach to Union and then increase speed of arrival at platforms as platform heights / widths are increased? Steve: The speed restrictions on the approach are not just from the platform conditions you describe, but from the convoluted nature of the approach tracks with trains proceeding through the array of slip switches rather than simply having a clear run into the station. There is a good analogy here with the way the subway operates at full speed and only begins to brake when this is necessary for a comfortable stop at the platform. Metrolinx has been talking about three important changes at Union. First would be to remove some of the tracks and extend platforms over the space that is released. This would eliminate the narrow platform problem, especially for the former baggage platforms which are substandard for passenger use. Second would be the dedication of specific routes through Union to individual services, with hookups to the east and west to avoid having platform time wasted by trains terminating at Union rather than stopping and leaving immediately. Only the Lake Shore East and West trains do this now. Third would be a change to high platform trains. I think the last of these is unlikely to occur soon because the Hydrogen Train study makes a point of showing how electrification of the locomotives, but not the passenger cars, would simplify the conversion. That implies the existing style of GO bilevel coach is going to be around for a long time and “high platform” will at best take the platform height to the lower level of these coaches, not to the height seen on conventional equipment like the UPX cars or on VIA. When we talk about “high level” it’s important to clarify which level is under discussion. Steve I understand this has been the argument forever of speed restrictions “due to convoluted nature of the approach tracks with trains proceeding through the array of slip switches rather than simply having a clear run into the station” – but I think this has to be bogus and due to lack of experience in North America operating higher speed trains (as is normal in Europe). Are we really saying that the approach to Frankfurt – which is a Y terminus to boot and not a thru station, where I made some of my recent observations on significantly higher approach speeds – is really less convoluted than Union? See wikipedia photo – looks *WAY* more convoluted to me! Steve: Note that the station and the approaches are much more spread out than at Union, and without even knowing the service pattern, it is fairly clear that berths in the station could be assigned in a pattern roughly similar to the approaching tracks. This would avoid trains meandering through the slip switches. More to the point, speed restrictions through switches are a function of turnout radii, comfort and safety. Speeding up operations at Union requires that use of these wandering paths through the east and west yards be reduced to a minimum. Metrolinx already acknowledges this. No study trip required. I have been looking at the Metrolinx Lakeshore East-Don River to Scarborough Expansion TPAP public meeting “Story Board” documents and specifically page 7 of the display boards. (a) oh boy – didn’t they think about needing to add track 4 and moving the station Eastward 50-100M when they added track 3, platform, subway, elevators, etc., when was that now <5 years ago! If the builders of the Prince Edward viaduct managed a ~50 year planning horizon what does it say about us! Steve – when will Metrolinx and TTC planners realize they have to work together in a timely fashion to avoid these comedy of publicly funded errors #RememberDundasWest. I assume since its 18+ months since this study was done there is no chance of any of this mess being improved? Can you help by knocking some (more) heads together? Steve: There is already a development study underway for the property north of Danforth Station and the possibility of including a link through this to the north. There would still be the question of getting across Danforth Avenue and into Main Station. This is not a cheap undertaking, and I am not convinced that the potential passenger volumes of this connection warrant the expense. It’s a long walk even if weather protected. As for expansion of Danforth Station itself, RER and its requirements are a fairly new scheme provincially, and this was announced more as a political matter than one of planning and engineering. Of course there are constraints all over the GO network, and the idea that we might actually get rid of some of them in order to run substantially better service is quite recent. Don’t forget that five years ago, SmartTrack as an idea did not exist outside of the machinations of some planners and property developers. The fourth track is triggered by the frequent all-day service on the Stouffville line running through to Union Station. As my 2 cents as a designer… are we so concerned about spending the right amount of money that we can't imagine a GO station on the bridge level with TTC streetcar tracks entering the station under a canopy totally separated from the road with steps / elevator / escalator down to the platforms immediately below? This is *common* in Europe – just look at a whole bunch of the new Crossrail/Elizabeth Line stations in London. If they can afford it and think its good value for money why can't we? I'm not even asking for a covered grade separated walk-way / bridge / tunnel to Main St TTC! And since in this plan the bridge will have to be rebuilt it means the platforms don't have to be shifted 50-100M Eastward making walking distances *even longer* than at present to get from Streetcar and Subway to/from GO. The current plan is going backwards – my walk from the streetcar with suitcase to get the GO train to a VIA train is going to get worse not better! When will someone tell these so called designers on behalf of the public to stop being so timid and start to put the transit user's convenience at the top of their list of priorities! Steve: You design is possibly worth two cents, but not much more. Vast expense on one local station that happens to be yours. There is a future for you as the Minister of Transportation.